Now the road curves round to a major junction and we lose the line of the curtain wall for a while. Here, beneath the mess that is the A69, something rather unusual happens: the Military Road leaves the line of the curtain wall. Instead it takes a much older and more influential line, which will come to dominate the town planning of Newcastle. The wall is now to the south of the road all the way to the centre, the road being in the ditch. Sound familiar? It ought to. There is, as you will have gathered, not much to see in this Wall Mile, which chiefly requires us to carefully negotiate our way across the junction and end up making our way eastwards, down the ramp leading off the southern carriageway of the A69. There now, that wasn’t too hard to understand, was it?! 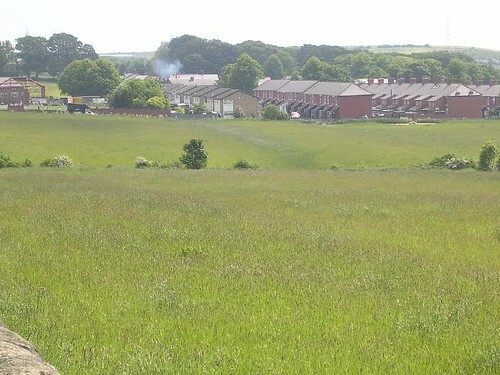 If you can see a metal footbridge over the A69 in the distance, then that is near the site of Milecastle 8. 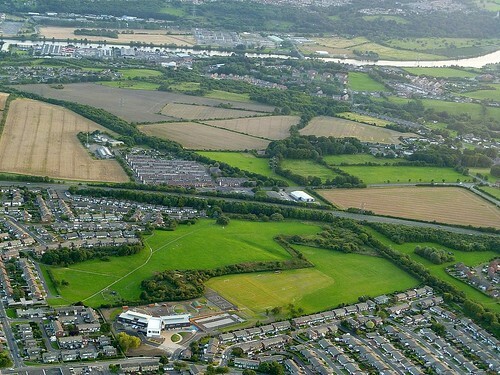 Milecastle 8 (West Denton) has never been located but should be somewhere in the region of the Sugley Burn (which passed through a culvert, located during the 19th century but long gone), or in other words, close to the Alan Shearer Activity Centre. Now that we are on the south side of the road, we can look across the wall at the fields. 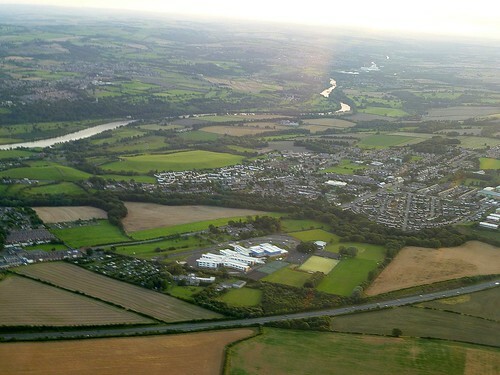 Nothing much to see, but the Vallum is there. In fact, if you look eastwards towards the terraces of houses in Walbottle, you can usually see a differentiation in the vegetation which marks its course (it is very clear from the air, as Google Earth or Maps confirm). The ditch has largely disappeared to the north of the road: this is indeed hostile territory in which to be a mural frontier, but it gets worse. Even so, as we shall see, the Wall nearly always wins through. We descend to Walbottle, passing a primary school built over the Vallum, then begin to climb once again, always gently, but the terrain is still key to the line of the Wall. We are now on a 3km straight stretch, the last part of which is lost in a huge interchange when finally we reach the A69. Past the school, in the field on the left, the hints of the Vallum are more substantial, but the curtain wall lurks beneath the road, still, and the ditch is lost to us. We cross over at a junction, the northern arm of which is a dead-end, cut off by the A69 (although the Google Street View car rather gamely goes down it anyway), the line of the Military Road still reflecting that of the curtain wall, with the Vallum to our right and the ditch to our left; the last shows up as lusher grass just beyond the roadside wall, reminding us it is still there. A sign soon proclaims that we are entering Blucher Village, reflecting the name of the coal mine that once stood here, named after Gebhard Leberecht von Blücher, the Prussian general who saved the day at the Battle of Waterloo. At the far end of the terrace of houses, as fields open out to the south of us again, we reach the site of Milecastle 9, shyly loitering behind a park bench and a flowerbed. Milecastle 9 (Chapel House) is a special milecastle. ‘Why is that?’ you may justifiably ask. Well, this is the one Eric Birley was digging when Chesterholm (Vindolanda) was put up for auction and he decided to buy it. This long-axis milecastle was excavated in 1929, 1951, and 2000, when details of an internal building were noted, whilst outside the south wall, three skeletons (one of them headless) were found. They were thought to be Roman or post-Roman, but it is interesting to note that there was a curious trend in headless burials from the late 3rd century AD onwards which has caused much speculation amongst scholars (executions and barbarian beheadings being invoked). Some of the stones of the milecastle itself were marked with Roman numerals and it is thought this may relate to the way in which they were quarried. As we continue down the hill through Throckley, passing the old reservoir, the berm pits continue beneath the road. Our environment is still suburban but housing is beginning to crowd us in. Here the survival of Hadrian’s wall is always on a knife edge, the remains sparse and frequently heavily damaged when excavated. But it is still there and boldly continues to exert its influence on the landscape as we make for the terminus. The Military Road is soon interrupted by a roundabout at the point where a major drove road from Scotland to England crossed it. Long used for taking stock south and across the Tyne by the ford at Newburn, in 1640 it saw a Scottish Covenanter army use it, leading to a skirmish by the river which became known as the Battle of Newburn (although it was less of a ‘battle’ and more of a ‘flight’ on the part of the English royalist forces). Was there another transhumance gateway through Hadrian’s Wall here? We don’t know, but such drove roads tend to be old. All the time we have kept to the north pavement, but soon it will be best to change sides to the south. 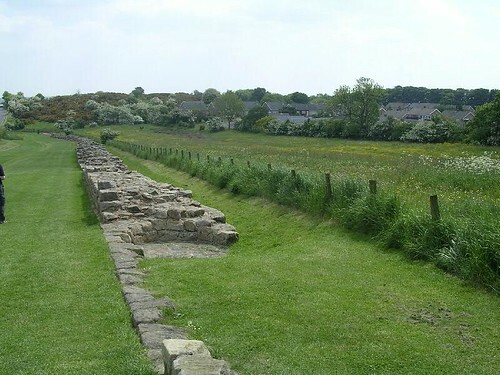 After the roundabout, the Wall plunges down into Walbottle Dene (known in Hutton’s day as Newburn Dene) before ascending again to the location of Milecastle 10, on its eastern rim. The bottom of the Dene is a good place to cross as the traffic is warned by signs and rumble strips that pedestrians will be doing just that; nevertheless, take care. Although the curtain wall usually seems to have been beneath the southern (westbound) carriageway of the 18th-century road, at this point the builders chose to swing slightly southwards and the road passes straight through the middle of Milecastle 10 (Walbottle Dene). The deviation in the course of the Military Road means the north gate of the milecastle survived and was duly excavated in 1928. 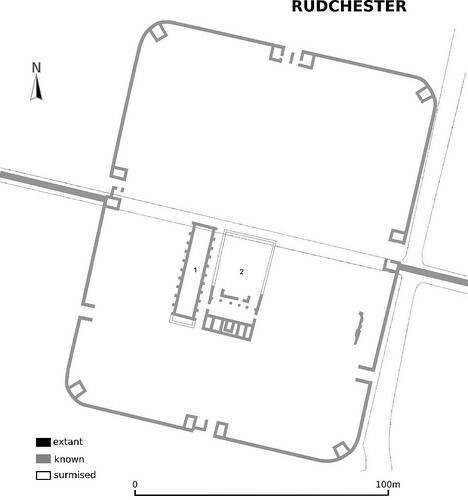 The southern wall was examined in 1999–2001, revealing the milecastle to be of the long axis type. There is, as you might have guessed, nothing to see any more. Give thanks for Heddon-on-the-Wall. Why? 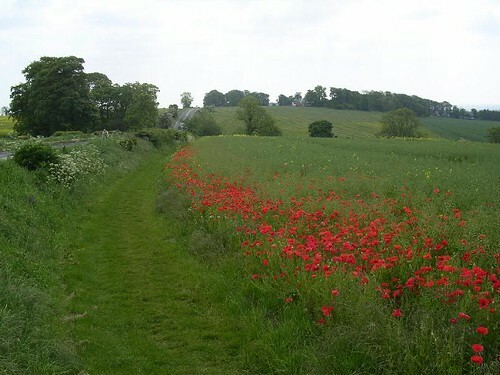 Because the fact of its existence caused the Military Road to make a small diversion in order to avoid it, thereby preserving a rather splendid length of curtain wall and ditch for our delectation and pleasure. The National Trail, however, now chickens out and dives off down the hillside to send the unwary wandering along the riverside for no good purpose. Don’t worry; the price they pay for this abject act of cowardice is that they have to walk further than we do and they are going to miss some rather good bits of Wall (including the smallest piece of consolidated curtain wall) into the bargain. 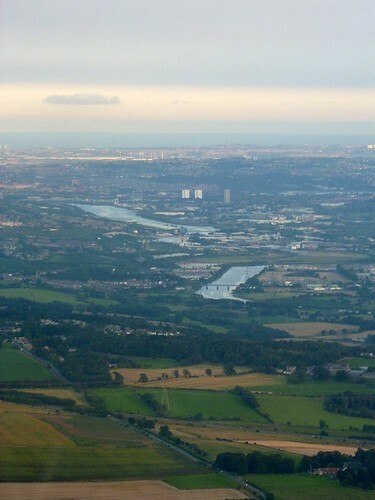 Now, dear reader, we are on our own until we are reunited with these view-seekers at Wallsend. 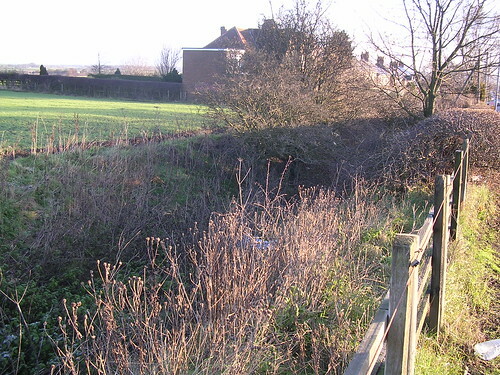 There are various signs that point us towards the consolidated length of wall at the east end of the village. We slip through a narrow gate and instantly we are walking along the line of the ditch, with the wall immediately to our left. In the distance we can see the point where the Military Road and curtain wall reunite, but for the time being we can enjoy this section of Broad Wall. It is some 215m in length and survives up to seven courses high. Near the west end, a circular kiln has been inserted into the ruins of the wall, possibly during the post-medieval period. 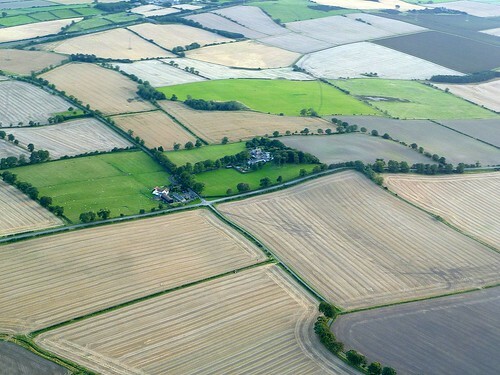 Reassuringly, the Vallum survives as a subdued earthwork in the field to the south. As we leave the sanctuary of this length of wall and its boot-welcoming turf, we can cross over to the pavement near the point where the curtain wall rejoins the Military Road at the crest of the hill. Or, at least, it used to. 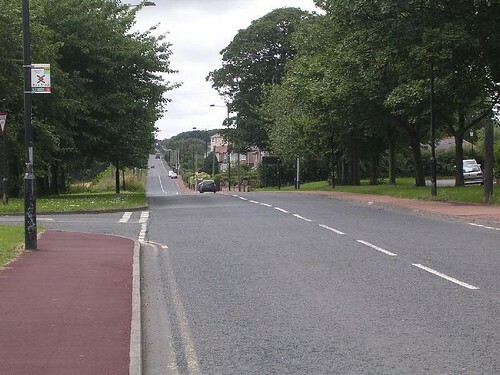 In 1926, Northumberland County Council decided to improve the gradient on the road and, in so doing, grubbed up some 55m of the wall which lay beneath the original road surface. Remember, that’s a length of wall preserved by the Military Road, and destroyed by a county council! Luckily it was possible for Parker Brewis to excavate it before its destruction. It is wise to take with a pinch of salt all protestations of vandalism levelled against the original builders of the road; there are plenty of sections of curtain wall destroyed in the medieval and post-medieval periods where there was no road to blame (as William Hutton found at at Planetrees). 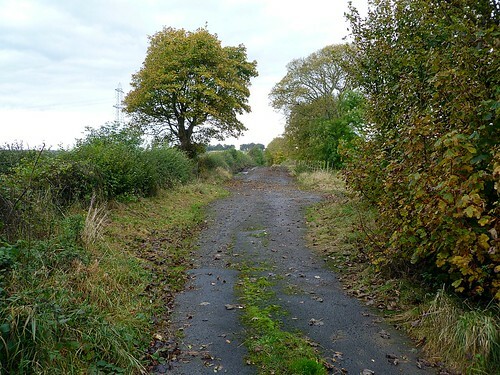 The Military Road is just one of many predators that have nibbled at the corpse of Hadrian’s Wall. Once we have reached the crest of Great Hill there is a long, gentle, downhill slope before us and some rather exciting archaeology buried beneath the road. From here, the Wall runs in a dead straight line to Milecastle 11. 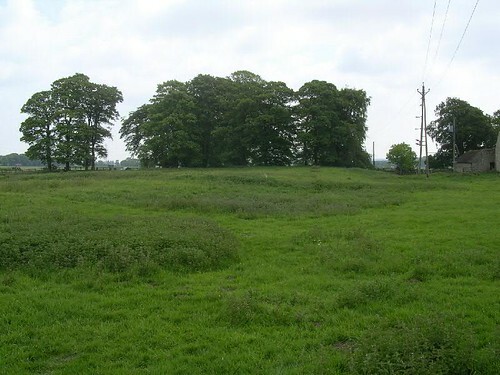 Now the ditch is to our left, albeit overgrown, the curtain wall lies beneath the southern carriageway, and the Vallum is in the field to the right, often visible as a crop or parch mark. The north carriageway lies on the line of the berm and it is this that has proved to be rather interesting. Excavation during work to improve the water mains along this stretch of the road found that the berm was covered with pits arranged quincunx fashion (like the spots on the 5 side of a die). These have been interpreted as pits designed to hold obstacles such as thorn bushes, acting like a barbed-wire entanglement. This would not only hinder an enemy coming across the ditch, from north-to south, but also stop anybody running along the berm to gain an advantage over patrols along the Wall. One writer has, however, suggested that they are no such thing and in fact represent an early timber predecessor to Hadrian’s Wall. An interesting idea, but the absence of a berm between this putative timber wall and the ditch would make it unlikely on the grounds of stability, if nothing else (remember how Turret 54a suffered from inattention to this important point). 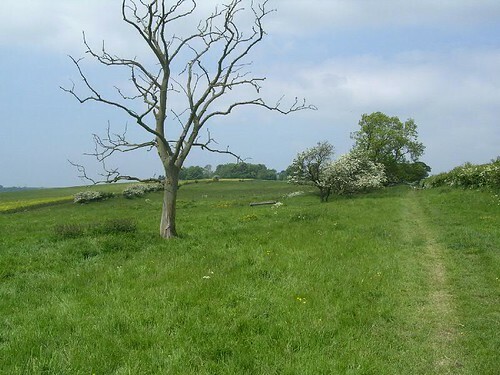 Then it is just a long, steady walk along the pavement (passing Frenchmen’s Row on the left, home to refugee French royalists in the late 18th century) until we reach the crest of the hill down to Throckley, the approximate location of Milecastle 11 (Throckley Bank Top). As you will already have deduced, this milecastle has also proved elusive, although by measurement it should lie somewhere under the working men’s club south of the road. Leaving the site of the milecastle, we still have a bit of field to walk down until we have to undergo some diversionary jiggery-pokery in order to negotiate the A69, which has been rather thoughtlessly inserted across the line of the Wall and the Military Road. The B6318 (as it now is) lurches to the left, then hangs a right across a bridge, then left again to rejoin the line of the curtain wall, which is what we too must do. We pass up steps and through a gate to be guided along the edge of the road until the Trail rather inelegantly abandons us to get over the bridge by our own devices, skirting some Armco barrier on the way. Crossing over (carefully – remember the manic motorists) will not only provide the benefit of a pavement but also allow inspection of the ditch, which is going to reappear shortly. Our enjoyment of this section is not particularly enhanced as we pass over the A69 by the accompanying roar of the traffic beneath us until, to our left, just before the road turns left again, we get a view along the ditch as it strides up to Heddon-on-the-Wall. Now look to the right and you can see the orphaned section of the Military Road produced by this diversion when the new road was built. Excavation beneath this section showed that the foundations of the curtain wall were still intact here, even if they have vanished (or, more correctly, been removed) elsewhere. Our path is now leading us inexorably through the western limits of Heddon towards its centre, accompanied by the vegetationally hirsute ditch to our left, the curtain wall to our right (beneath the road, naturally), and the Vallum in the fields beyond. We are now going to have to get used to walking on pavement, as there is rather a lot more of it to come before we reach our goal on the north bank of the Tyne at Wallsend. When we get to the end of the road (which is even called Military Road here on the street sign) and reach the junction, we need to cross and end up on the same side of the road as the petrol station. We then turn right but immediately bear to the left, keeping the war memorial on our left-hand side. A curious low metal gate guards the entrance to Chare Bank and that is where we want to be going. The sensible walker is advised not to attempt limbo-dancing under it. This lane leads us gently up hill, with the old church (it has Anglian origins) perched on a mound to our right, until we reach the top, where Milecastle 12 ought to be. Milecastle 12 (Heddon) has proved quite evasive. It should be located near the top of Chare Bank but attempts to find it have so far only produced what was thought to be a bit of the north gate in 1926. When the Military Road was being constructed here in 1752, a hoard of coins was found nearby, causing something of a furore; unfortunately nobody thought to record the contents, so we know nothing about it. As we leave the milecastle and the change of course for the Wall, we come down to the March Burn, crossed with the aid of a dinky yet serviceable bridge. Now we have a slight climb up towards Rudchester, placed in a commanding position to look to both east and west, whilst keeping one eye to the south too. The views to the north are nothing to write home about, however, but in this the fort builders were constrained by the line of the Wall and its own particular tactical requirements. As we enter the field containing the fort, the first impression is of an unspoiled gem, and that is partly correct. Like Chesters and Haltonchesters, Rudchester straddles the Wall (and, of course, the Military Road here) and although the southern portion displays enough humps and bumps to delight the head of any major national heritage organization, the northern part has been under the plough for many years and is a very different story. The site is actually owned by Northumberland County Council and one senses it is their little nest-egg, put aside for the day when something exciting can be done with it. 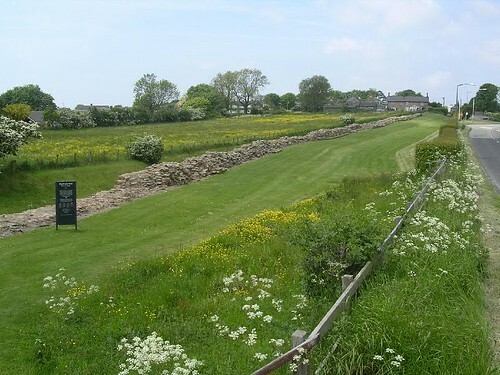 Rudchester is 7.5 miles from Haltonchesters and is 1.8ha (4.5 acres) in size and excavation found that the fort was built over the Wall ditch. The unit which the Notitia tells us was in garrison in the 4th century, the cohors I Frisiavonum, was probably there in the 3rd century as well, but the earliest occupants are unknown. We depart Rudchester by a gate that dumps us onto another manic rat-run, with a blind corner just metres away to the right, so extreme caution must be exercised in crossing this road. Once safely on the other side and through the next gate, we have a gentle downhill stroll past a line a hawthorn bushes, with the Military Road raised up to our left (and the curtain wall under it), intimations of the Vallum to our left, and the outskirts of Heddon-on-the-Wall coming into view beyond the A69. 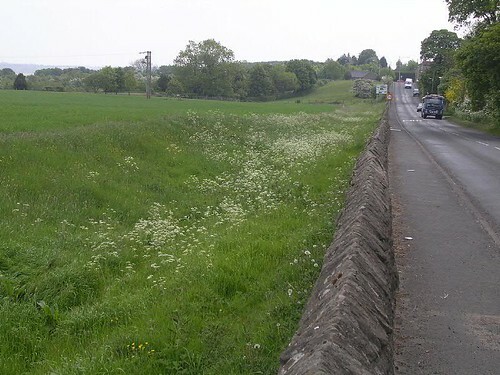 About 140m after we pass a gate in the wall on our left – and with the A69 making its presence felt – we arrive at the site of Milecastle 13 (Rudchester Burn). A short-axis milecastle, it was excavated in 1930, although its remains are now barely perceptible as a slightly raised platform. Treasure-lovers will be delighted to hear that a pot of 516 gold and silver coins was found here in the year of the American declaration of independence, although it is doubtful whether the two facts are linked. The latest coin dated to 168, thought to be a troubled time in northern Britannia. When thinking of Roman coin hoards, it is always difficult not to recall Samuel Pepys and his attempt to hoard coins when a Dutch invasion was threatened (unlike the Romans, he did not have the foresight to use a container that would not perish and so rendered recovery that bit more tricky). Continuing along the line of the ditch to the north of the Military Road, we start to climb again until the point where an elaborate set of steps warns us that we are about to be required to cross the road again. Once again, care is need to avoid the pedal-to-the-metal motorists who, despite signs warning them of pedestrians crossing, seem disinclined to brook any laggards. Safely on the other side, we turn to continue our climb to the east, aiming for the top of Eppies Hill. 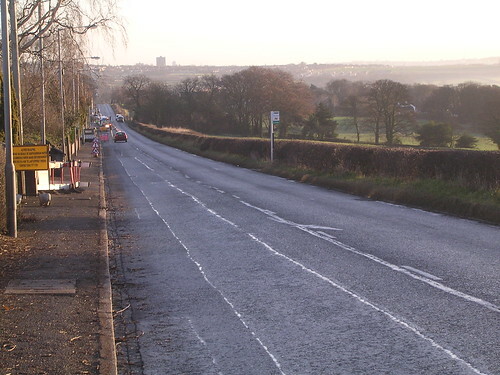 Like Harlow Hill, Eppies Hill was chosen as a point to realign the course of the Wall and, as has recently been pointed out, the fact that in both cases the change was made immediately west of the crest is indicative of surveying and laying-out (but not necessarily construction) being carried out along here from east to west. 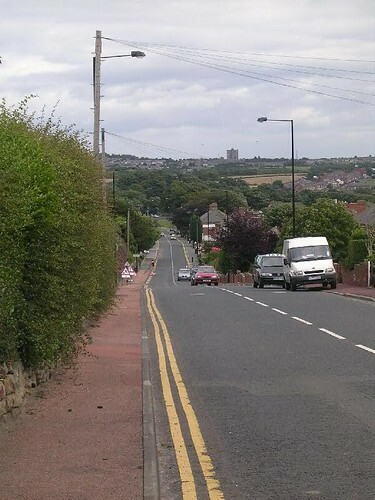 As you near the crest, look back at the die-straight length of road (and under it wall) running to Harlow Hill. We now veer onto a slightly more northerly course before coming to a junction where another rather spectacular detour is necessary to circumnavigate a recalcitrant property. We must turn left down a lane, which has the misfortune of being something of a rat-run for motorists wishing to shave a few seconds in their transit between the Military Road and the A69, so extreme care is necessary as there is no pavement for the best part of 280m before we once again turn east off the road. After 250m on this path it then takes us back north to the line of the wall, so that – bizarrely – we have walked the best part of 800m to cover 300m of wall. Such are the occasional inanities of the Hadrian’s Wall Path National Trail. Back on the line of the wall, we soon arrive at the location of the next milecastle, within sight of the fort at Rudchester and just before another turn in the line of the Military Road and its underlying curtain wall. There is nothing to see of Milecastle 14 (March Burn), which was examined in 1946 and 2000 and found to be probably a short-axis example of its kind, but there are impressive views south towards the Tyne valley and, since it is directly under the approach to Newcastle airport, upwards at the bellies of aircraft landing at or taking off from there.